As early as 1956, the State of Wisconsin Board of Health notified the residents of Highwood Estates, Hickory Hills Estates and Edgerton Beach Park in the Town of Albion, Dane County, that they recommend that they form a committee to prepare a petition to form a town sanitary district. In 1967, the district was little more than a pipe dream for a few citizens, including Bill Cunningham, around Lake Koshkonong. By that time, the State Board of Health had already received complaints for more than ten years regarding the lack of adequate sanitary wastewater treatment at residences around the lake. 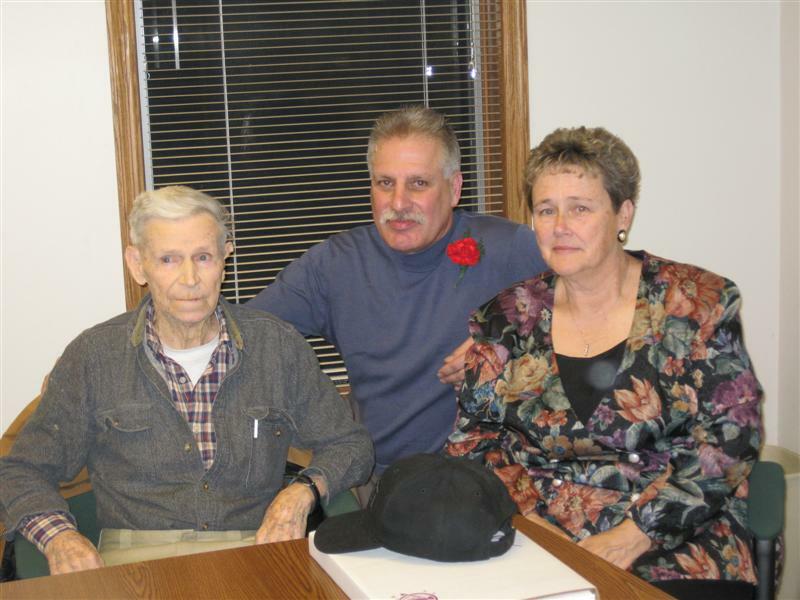 As a lifelong resident and farmer of the area, Bill was concerned about the health of the lake and the people who lived around it. He decided to take action, so he brought his concerns and determination to correct the problem, to the first public meeting held in the area on September 14, 1967. For the next three years, Bill continued to work for a system that would cure the water pollution woes of LakeKoshkonong. 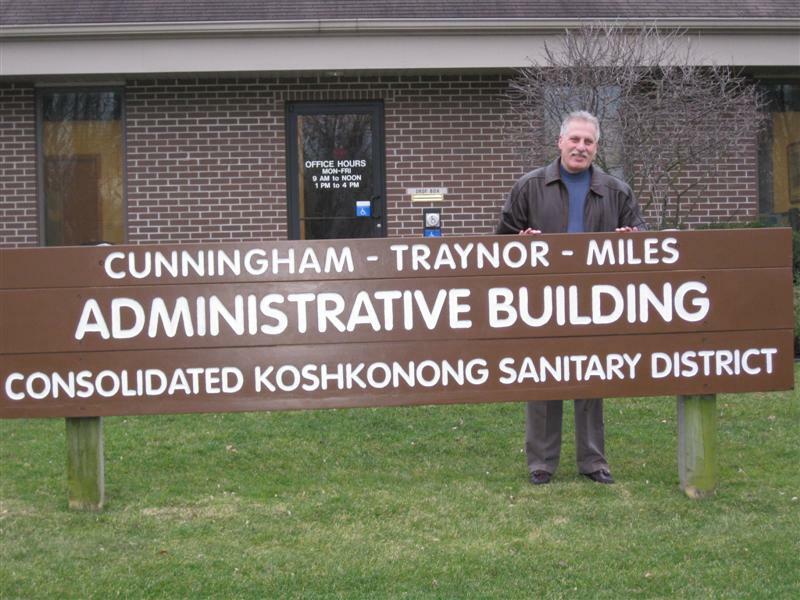 As a Supervisor of the Town of Milton, Bill worked with officials from other neighboring townships to guide the hopes and ideas of area residents to a workable solution – a formation of the Consolidated Koshkonong Sanitary District (C.K.S.D. ), in 1971. C.K.S.D. 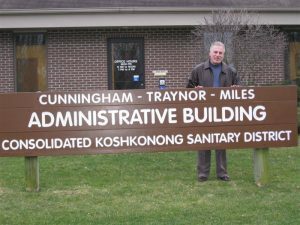 included the following town sanitary districts: Koshkonong Sanitary District No. 1, Town of Milton, Rock County; Koshkonong Sanitary District No. 2, Town of Fulton, Rock County; Koshkonong Sanitary District No. 3, Town of Albion, Dane County; and Koshkonong Sanitary District No. 4, Town of Sumner, Jefferson County. Construction of the district’s sewage collection and treatment system began in 1972, at a cost of $4.8 million. Bill Cunningham served as a Board member of the C.K.S.D. since its beginning and became Board President in 1976 and held that position until his retirement in 2003. On July 17, 2003, the C.K.S.D. held a dedication for Bill and to honor his service they named the Administrative Building after him; known as the William E. Cunningham Administrative Building. Because the C.K.S.D. was being started from scratch, they had to set up an office during construction. Pat Mair was hired and started with the C.K.S.D. in May of 1972. Pat’s main duties during the construction were to set up the accounts, pay bills and take minutes at the meetings. Since the C.K.S.D. did not have any office space at the beginning, they rented space at the Town of Milton town hall. Pat retired from C.K.S.D. in July of 1994. On April 1, 1973, Jerry Miles began his employment with the C.K.S.D. as Superintendent. Jerry overseen the daily operations of the C.K.S.D., with four employees under him. In 1971 when the C.K.S.D. was formed, a “Contract Creating a Commission and Providing a Plan for the Administration of Said Commission” was signed by all four town sanitary districts. In 2004, the C.K.S.D. started to look at this contract and decided that it was very outdated. During part of 2004 and 2005, the C.K.S.D. worked to update this contract. The result was the new C.K.S.D. Operating Agreement, which took effect March 22, 2005. During the time that the C.K.S.D. was working on this update, Fulton Sanitary District No. 2 was installing a sewer system in the Indianford area. Fulton Sanitary District No. 2 attached to the C.K.S.D. on March 19, 2004. Harold Traynor, representative of the Town of Milton, started on the C.K.S.D. Board in November of 1972. Harold was on the C.K.S.D. Board until he retired in March of 2007. On August 2, 2007, C.K.S.D. held a dedication for Harold to honor his service and named their conference room after him; now known as the Harold Traynor Conference Room. 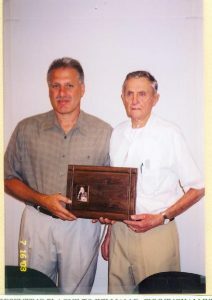 Harold was the longest Board member to serve on the C.K.S.D. Harold’s grandson, John Traynor, has taken over his seat on the sanitary district Board and the Town of Milton Board. The C.K.S.D. now has 224,451 feet of sewer that they maintain, 22 lift stations and three 6-million gallon aerated lagoons which serve as their treatment process. Albion Sanitary District No. 4 attached to C.K.S.D. effective January 1, 2010. The C.K.S.D. is currently involved in a Pumping Station Rehabilitation Project. The wastewater treatment plant and collection system has been in operation since 1973. The system has basically been operating with the original equipment that was installed in 1973. The C.K.S.D. now finds itself in a situation that repairs for current equipment can not be made. Companies are no longer making parts for a lot of the equipment. C.K.S.D. has hired the engineering firm of Strand Associates, Inc. to provide the C.K.S.D. with a design report for the rehabilitation of the pumping stations. On December 2, 2009 the Administrative Building was re-named to include long time employee, Jerry Miles. Jerry served as Superintendent for 37 years. He was associated with the C.K.S.D. longer than any other person and was instrumental in the success of the district over all those years. Jerry has now retired, with his last working day with the district being December 31, 2009. The district thanks Jerry for his 37 years! He has been a very dedicated and hard working employee of the district. Jerry will be missed by us all! On December 1, 2011 the C.K.S.D. 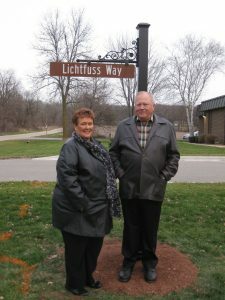 dedicated their entrance to their facilities "Lichtfuss Way" at a dedication held for Kathleen Lichtfuss on December 1, 2011. Kathleen served as a Commissioner on the Board for over twenty years and served as the President of the Board for over eight of those years. Kathleen retired as of December 31, 2011. The C.K.S.D. Board consists of a five member Board; including representatives of the Town of Albion, Town of Fulton, Town of Milton and Town of Sumner. At this time, John Traynor, Town of Milton representative serves as the President; Rich Plywacz, Town of Fulton representative, serves as the Vice President; Bruce Hudson, Town of Albion representative, serves as the Secretary; Barb McGann, Town of Sumner representative, serves as the Treasurer; and Russell Sime, Town of Sumner representative, is also a Board member.